Award-winning Cayuga Associate Professor Sheila Myers will discuss the Adirondacks’ legendary Durant family and the trilogy Myers wrote about the family at 4 p.m. Oct. 15 in the Student Lounge on Cayuga’s Auburn Campus. 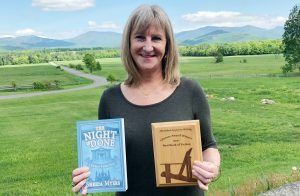 A Cayuga Community College associate professor and award-winning author will discuss her novels and the history of a prominent Upstate New York family at the College’s next Cultural Speaker Series presentation. Currently in its inaugural season, the Cultural Speaker Series is welcoming Cayuga Associate Professor Sheila Myers to discuss the Adirondacks’ legendary Durant family and the trilogy Myers wrote about the family’s rise and fall. The discussion is scheduled for 4 p.m. Oct. 15 in the Student Lounge on Cayuga’s Auburn Campus. Emily Cameron, Cayuga’s Assistant Director of Community Education and Workforce Development, said the series offers people a chance to learn about local culture and history, and appeals to those who are new or familiar with the topics. Cameron said Myers’ research and novels were particularly appealing because of their illustration of Upstate New York’s extensive contributions to history. Her research took her to the Library of Congress, the New York State Public Library System, Winterthur Museum and England as she tracked down information about the Durant family. Myers said she’s looking forward to discussing the Durants, her research and her novels with the audience. In addition to her upcoming presentation at Cayuga, she has also been a guest lecturer at the Adirondack Experience Museum, the Saratoga Historical Museum and at SUNY Cortland and SUNY ESF properties in the Adirondacks. Myers’ books will be available for purchase at the discussion, with proceeds going to the Seymour Library in Auburn. To find out more about her research and novels, visit wwdurantstory.com. Registration to attend the presentation is encouraged, but not required. There is a $5 fee to attend. For more information about Cayuga’s Cultural Speaker Series, including details about future presentations, visit https://www.cayuga-cc.edu/blog/series-to-highlight-cayuga-county-history/.